Egypt's new president moved to assert his authority and regain control of the streets Saturday even as his Islamist opponents declared his powers illegitimate and issued blood oaths to restore Mohammed Morsi, whose ouster by the military has led to dueling protests and pitched street battles between rival sides. CAIRO — Egypt’s new president moved to assert his authority and regain control of the streets Saturday even as his Islamist opponents declared his powers illegitimate and issued blood oaths to restore Mohammed Morsi, whose ouster by the military has led to dueling protests and pitched street battles between rival sides. But underscoring the sharp divisions facing the untested leader, Adly Mansour, his office said it was naming Mohammed ElBaradei, one of Morsi’s top critics, as interim prime minister but later backtracked on the decision. Mansour’s spokesman Ahmed el-Musalamani denied that the appointment of the Nobel Peace laureate was ever certain. However, reporters gathered at the presidential palace were ushered into a room where they were told by an official to wait for the president who would arrive shortly to announce ElBaradei’s appointment. A senior opposition official, Munir Fakhry Abdelnur, told The Associated Press that the reversal was because the ultraconservative Salafi el-Nour party objected to ElBaradei’s appointment and mediation was underway. Tensions were high as tens of thousands of Morsi supporters rallied for a third day near a mosque in a Cairo neighborhood that has traditionally been a stronghold of Islamists, chanting angry slogans against Wednesday’s toppling of the country’s first democratically elected president by Gen. Abdel-Fattah el-Sissi. The general has denied the military staged a coup, saying he was acting on the wishes of millions of Egyptians protesting the ex-Islamist leader. But no major violence was reported Saturday as all sides regrouped after a night of fierce clashes between Morsi’s supporters and opponents that turned downtown Cairo into a battlefield. Setting up another showdown, the youth opposition group behind the series of mass protests that led to Morsi’s ouster called on Egyptians to take to the streets on Sunday to show support for the new order. Mansour, 67, the former chief justice of the country’s constitutional court who was installed by the military as an interim leader, met earlier Saturday with el-Sissi and Interior Minister Mohammed Ibrahim, who is in charge of the police. He also met separately with the three young leaders of Tamarod, or Rebel, which organized the massive opposition protests that began June 30, the anniversary of Morsi’s inauguration. Morsi’s Muslim Brotherhood, meanwhile, has promised to boycott the political process, saying the military maneuver was a coup that overturned a democratically elected government. Morsi, a U.S.-trained engineer who was widely accused by critics of monopolizing power for himself and his Muslim Brotherhood as well as his failure to implement democratic and economic reforms, remained under detention in an undisclosed location. 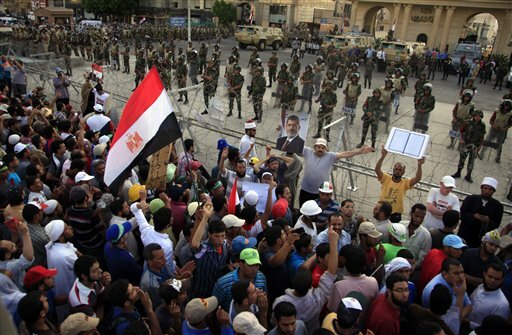 The 2011 uprising that ousted autocrat Hosni Mubarak opened the way for the political rise of the Muslim Brotherhood, which was long under suppressed by Mubarak’s Western-backed regime, and Morsi was elected last year by a narrow margin. The fundamentalist movement swiftly rejected earlier news of ElBaradei’s appointment, calling the 71-year-old former U.N. nuclear negotiator a remnant of Mubarak’s regime. The Brotherhood has promised to boycott the political process, saying the military maneuver was a coup that overturned a democratically elected government. The silver-haired new president, meanwhile, insisted national reconciliation was his top priority. “I want everyone to pray for me. Your prayers are what I need from you,” he told worshippers on Friday who approached to shake his hand and wish him well, according to el-Tahrir. On Saturday, he met with el-Sissi and Interior Minister Mohammed Ibrahim, who is in charge of the police. Later he met with the three young leaders of Tamarod, or Rebel, which organized the massive opposition protests that began June 30, the anniversary of Morsi’s inauguration. Despite his words, both sides braced for the possibility of more violence as Egypt’s political unraveling increasingly left little room for middle ground or dialogue. In the northern part of the Sinai Peninsula, gunmen shot dead a Christian priest while he shopped for food in an outdoor market on Saturday. It was not immediately clear if the shooting was linked to the political crisis, but minority Christians have faced increased attacks in the wake of the Islamist rise to power in the nation of 90 million people. In Cairo’s eastern suburb of Nasr City near the Rabaah al-Adawaiya mosque — the main rallying Muslim Brotherhood rallying point — lines of fighters brandished homemade weapons and body armor at road blocks decorated with Morsi’s picture. Next door in the relatively upscale Heliopolis district, people chanted against Morsi and honked car horns in appreciation of roadblocks manned by Egypt’s military. Security forces boosted their presence with armored personnel carriers and checkpoints across the nation’s capital. A Cairo court, meanwhile, adjourned to Aug. 17 the retrial of Mubarak over charges of corruption and involvement in the killing of protesters during the 2011 uprising that ousted him. Mubarak and his two sons, Alaa and Gamal, who are on trial for corruption, appeared at the court session on Saturday. Mubarak is charged with both corruption and responsibility for the deaths of some 850 protesters during the early days of the 2011 revolt. The former leader was convicted in 2012 of the charges, but an appeals court granted a retrial. Associated Press writers Paul Schemm and Mariam Rizk contributed to this report.